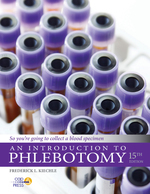 So You’re Going to Collect a Blood Specimen is a basic instructional text and functional reference guide for phlebotomy. This well-illustrated manual provides step-by-step instruction for obtaining blood by venipuncture and skin puncture from adult and pediatric patients. Blood smears, blood cultures, and neonatal screening procedures are also included, as is the order of draw for different procedures, with the goal of obtaining a quality specimen and avoiding specimen rejection. Both routine collections and those with special circumstances—patients on IVs, difficult or missing patients, patients in special care areas (nursery, isolation, psychiatric unit, radiation hazards), and paternity/forensic/ dentity testing— are covered. Safety, including standard precautions, sterility, competency assessment, and quality assurance, is emphasized throughout.